Many people would say that just standing on top of this tower is frightening enough, but to go on rides that takes you over the edge? What were they thinking? With three ride tickets secure in my back pocket, I joined others eager to enjoy the views from the top of this landmark tower. My jaw-dropped as I walked onto the open observation deck to admire the stunning panorama over Las Vegas, it really is very high up. I could feel the fear. Screams of excitement led me to one side where I watched in awe as ‘X-Stream’, a space ship like car for eight people, propelled along a pole out over the tower’s edge and then out of the blue, dropped another 10 feet or so, seemingly falling into the abyss below. 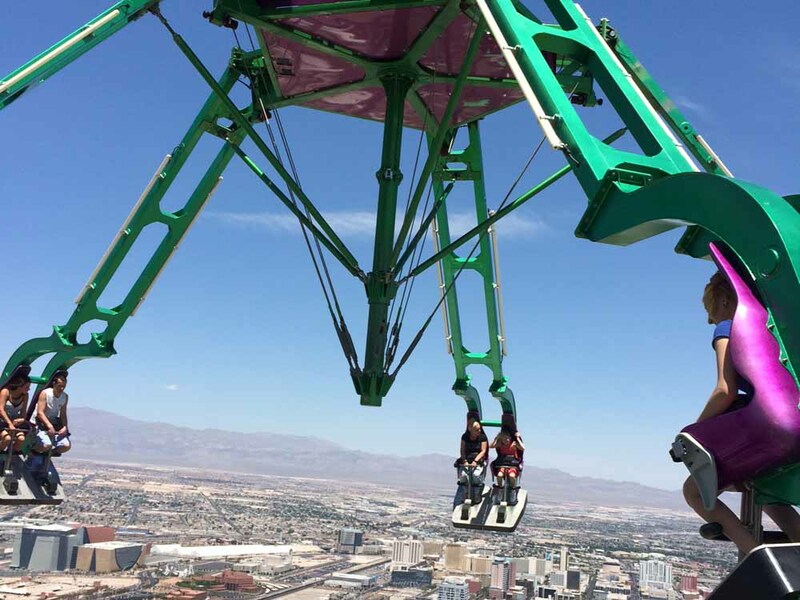 As all on board screamed and gasped as they were tossed backward and forward, I thought ‘no way’ and retreated to see if the other rides were perhaps less scary. ‘Insanity’ lived up to its name, a ride with 10 people strapped into seats seemingly hanging from a giant claw, that slowly swings it’s human cargo out over the edge of the Tower and then spins them around and around with a centrifugal force that lifts their feet out from under them revealing the ground directly below their eyes. That left just one choice, ‘Big Shot’, a 4G ride up the tower’s mast for an even higher view of Las Vegas followed by a 3G drop. At least this ride was within the perimeter of the tower, I thought, and decided to give it a go. No amount of deep breathing and anticipation could prepare me for the sudden jolt as our row of four seats is catapulted several metres into the air. It was such an amazing rush of adrenalin it had us all laughing with excitement and relief when it was over. Feeling a little braver, I decided to try Insanity. I chose the seat with its back to the view and tried not to look down until we were hanging well out from the tower. 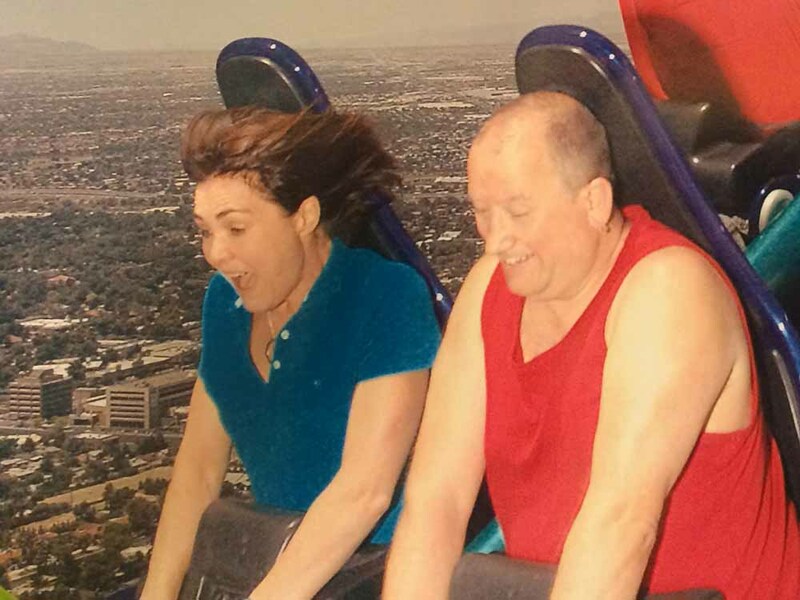 The ride sure lived up to its name, it is INSANE to hang 270 metres above the ground and be spun like a cork! With two rides down and my personal challenge secretly shared with my Insanity partner, Kevin, there was nothing for it but to try X-Stream. Kevin insisted that if I was going to do it, we had to be in the front row. So in I climbed, got myself strapped in and then waited… and waited. Until out of the blue, the pole lowered and it was our turn to be propelled into oblivion and have our stomachs left behind as we are dropped and hung a few metres out from the tower. That’s sure some ride, I can’t imagine another like it (except maybe the Mini-Mouse roller coaster at Sydney’s Royal Easter Show when I was about six and my two big sisters put me in the front seat, assuring me it was the best spot. My mother never forgave them). 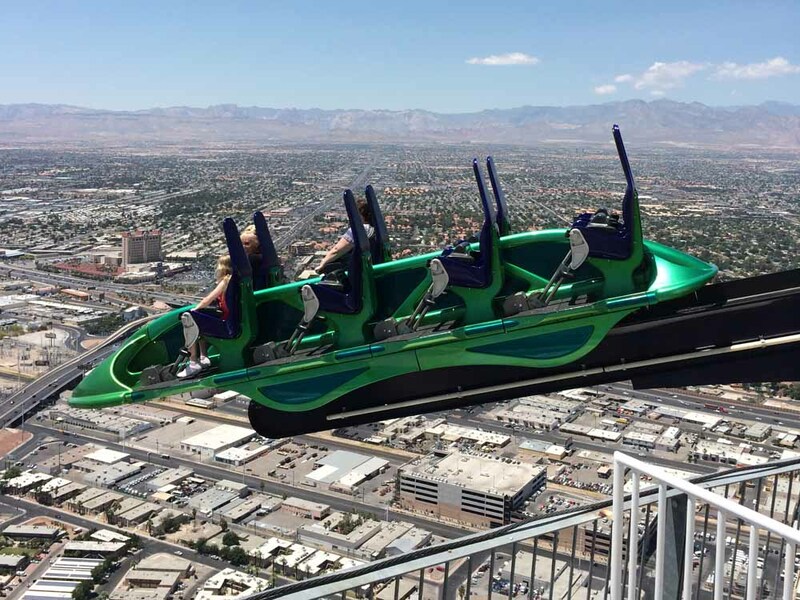 So would I recommend doing the Stratosphere rides? You bet! I’m proud to be able to say I did them, with my eyes wide open, and hope by facing my fear of heights that I am able to inspire anyone else who perhaps has a little voice inside their head telling them they ‘couldn’t possibly’ do it, that they can too. If I can do this, anyone can; like most things in life, it’s just a matter of making a decision and walking up to the starting point.